A Peacemaking Project by Sara T.
Young people are presented in the popular media to be apolitical, deviant, and in need of intervention. Some have even relegated youth, particularly youth of color, to be a problem population that needs to be controlled. In spite of popular discourse that suggests young people are problems, young people have always been the vanguard of social change. From the Civil Rights Movement to the current Black Lives Matter movement, youth have been the ones to lead progressive social movements that have fundamentally transformed the daily lives of so many marginalized populations. After attending UC Berkeley and learning the impact of social inequality on communities of color, particularly youth; my educational experiences inspired me to develop the Social Justice Sewing Academy (SJSA). This program facilitates free programming that teaches youth methods for engaging in social change in community context while creating participatory art as a vehicle for personal transformation and social change. To solve this injustice of youth voices being underrepresented. we will address the lack of youth voice by empowering students to use sewing as a medium to amplify their artistic voices and become agents of change. 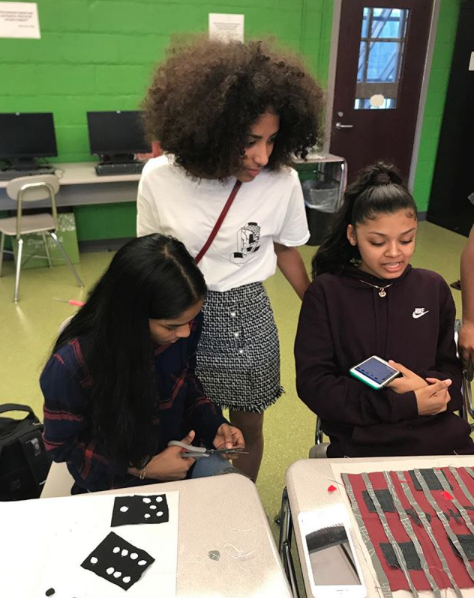 by providing free programming to ingrain resources and tools into our students so that they can work toward solving a social justice problem that resonates with them, specifically with art activism. The Social Justice Sewing Academy is a critical education program that fosters participatory art as a vehicle for personal transformation, community cohesion, and social change. We bring together artist-mentors, local youth, and community members to learn and experiment through place-based projects. We promote the model of the artist as citizen, actively engaged in conversations with our surrounding community through the lens of contemporary art. We support participants to become civically engaged artists as they are challenged to tackle current social issues in their community that directly affect their lives. Students involved in SJSA programming will show courage by creating art with a message - even if other people may not agree with their voice. I will use ZOOM to have monthly meetings with ambassadors, and reach out to potential mentors from Peace First. When students are sharing they are enjoying the program and feeling like they are making a difference. I’d say it deepened the teams understanding of the injustice by helping first hand with workshops. Hearing youth stories and narratives from their mouths and the impact and trauma it has caused them- is eye opening and usually demands a lot of empathy from a workshop facilitator- along with a desire to make change happen. I think these results are too soon to determine, however, schools have asked to have workshops and spaces to talk about social justice issues and ways young people can get involved. We did 5 workshops of over 30 kids each, and each block was sent out to an embroidery volunteer across the US. The blocks were then compiled into a quilt where it’s now currently hanging in a museum in San Jose, CA! I’d say easily 700+ people were impacted because at least 250+ people helped create the quilts and there were hundreds of people who have seen the art since the exhibit opening. In the artwork the young people created, often times they shared stories and alternative narratives through their social justice quilt blocks. For example, one young man made his block about gentrification and his block featured a silhouette of he and his grandma being evicted from their apartment in Oakland, Ca. We learned how under resources many public schools are and although kids may have never done it- sewing is really a timeless art form that should be used more! I think our curriculum design challenge was something the team overcame - how do we decide what type of programming to do with each group; we want youth to feel challenged but not at the potential cost of exploiting another youths lived experiences. Our entire process is based in community art. We have free workshops with youth and involve remote, but talented embroidery volunteers to enhance and embellish the youth design. I’d say start with mind mapping out what you want your projects objectives to be and hen outline out a realistic timeline and tangible goals! Making progress weekly makes things happen in the end. Sara T. 30 January 2018 10:35 With the funds from our PeaceFirst mini-grant we were able to engage 35 young artivists in creating activist works of art using textile fabric. Here are some photos! The videos and photos you have shown of this project are stunning. It's clear that there is a deeply transformative energy--positivity, trust, learning, expression--that happens in SJSA workshops. And that embroidery volunteers around the country are learning and growing and engaging as well. This work is so powerful, and I'm honored that we've been able to support it. I'm curious if you have ways for young people in your programs to take on leadership roles in the organization. Can they support planning and decision making? I'm wondering, too, if young people have expressed a desire to connect to a range of forms of activism after being involved in SJSA--how can they collaborate with local community members and orgs? I'd also love to, if it's useful to you, spend time thinking together about sharing narratives. v exploitation dilemmas (the challenge you named in your reflection). It's a real, huge question in social justice education spaces and I'm happy to be a sounding board if useful. Hey Sara! Love the new list of key steps you shared with us. Where does the curriculum you're developing fit into that? And -- where can we help? Sara -- great question. I can pass this around to gather more detailed thoughts if you like (and I'd encourage you to ask a question about this! https://www.peacefirst.org/questions). My initial thoughts -- pre- and post-test surveys sound great. You could build in quantitative data measures pretty simply by measuring their self-reported attitudes about peace and social justice on a 5-point scale pre- and post- SJSA sessions. I'd also encourage you to develop a tool to get feedback from adults -- teachers, principals, youth workers -- who work in each of the settings you implement your program, so they can testify to the lasting change you're creating! I used survey's for the most part- pre and post. It's pretty much all been based off qualitative data, but I would love more feedback on ways to measure impact! Any suggestions? Hi Sara -- that sounds fantastic. Love the idea of using art as a way to help young people identify -- and act on -- their social justice goals! We have a lot of young people with experiences scaling up community-based projects by giving other young people the tools to implement it in their own communities! If you want us to connect you to some of them -- let me know! I'd love to hear a little more about your pilot! What did you use/are you using to measure your impact? Thank you! I really think art can be used as a vehicle of resistance. and yes, I want to train people to start their own groups in their own communities, and provide them with the fabric, tools, materials for them to have their OWN workshops : ) on whatever issues they care about, LGBT rights, equal pay, etc. Just want to use the SJSA model for workshops to bring in crowds of young people to make their own goals happen. Then with my support I can turn the 'quilt blocks' they make during their own workshops into beautiful community quilt! I would love to definitely use this peace first group to be the initial pilot group of SJSA ambassadors, am really excited to get involved! Initial workshops have gone really well, the quilt blocks are actually spectacular, (& I'm not just saying that b/c I love sewing :) haha people are actually REALLY amazing at creating art even though this is their first time introduction to textile arts/ sewing! Hey Sara! Thanks for sharing your project with us. By ambassadors, do you mean that you're hoping to train people who will start SJSA groups in their own communities? That seems like a great idea. We have a lot of people here -- young peacemakers and mentors -- who have experience growing a project into other communities. They'd be happy to help -- just ask! How have your initial workshops gone?